It was a full house at the launch event for Norwich Sharing City held at Blackfriars Hall today. 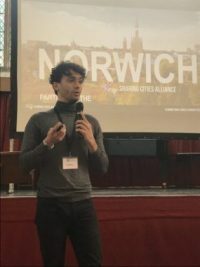 Norwich is officially the UK’s first sharing city, which means that the city is leading the way in providing opportunities enabled by the sharing economy. Including everything from sharing spaces, skills and assets, the sharing economy offers the chance for everyone to get involved and achieve more with less. Local sharing organisations represented at the launch included Liftshare, GoodGym, Norwich Farmshare, Refill, Culture Banks, KindaKafe, Castle Mall, New U, Norwich Car Club, The Norwich Note and Lumi from Norwich City Council. Organised by Norwich Business Improvement District (BID) this free to attend event, attracted around 100 attendees. Guests were welcomed by Stefan Gurney, Executive Director of Norwich BID who introduced opening talks from Mattia Marini, Chief Cities Officer of the Sharing Cities Alliance (based in Amsterdam) and Councillor Alan Waters, leader of Norwich City Council who commented on how important this initiative is for the city and supports the 2040 City Vision to be inclusive for all. Kate Price and Dan Harris from Norwich City Council showcased the Norwich Note and new platform, www.lumi.org.uk where individuals, companies or clubs can share skills, resources or venues. Ali Clabburn, CEO of Liftshare highlighted the global environmental challenges we face and that they have already helped drivers and passengers save 750 million car miles. Lastly, Sue Buffin and Caitlin Seale from New U, a clothes and accessories swapping shop and the UK’s first cashless shop, based in Castle Mall talked about how they’re helping young people get access to smart clothes for free when attending job interviews. Caroline Bidewell, Head of Operations, Norwich BID said, “Today Norwich has been put firmly on the map as the UK’s first Sharing City. It’s been fantastic to see so much enthusiasm for the sharing economy and celebrate local initiatives. We hope this event will act as a catalyst to shape more activity in the city, to be shared will alliance members across the globe”. ⟵Norwich named UK’s first sharing city – but what does it mean?